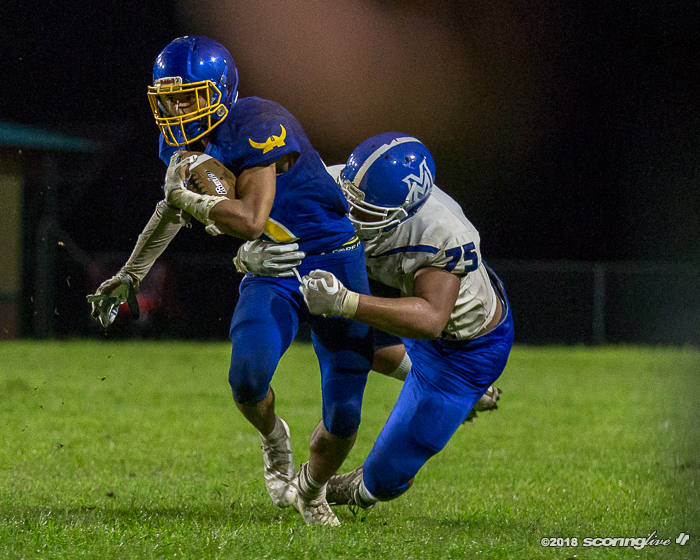 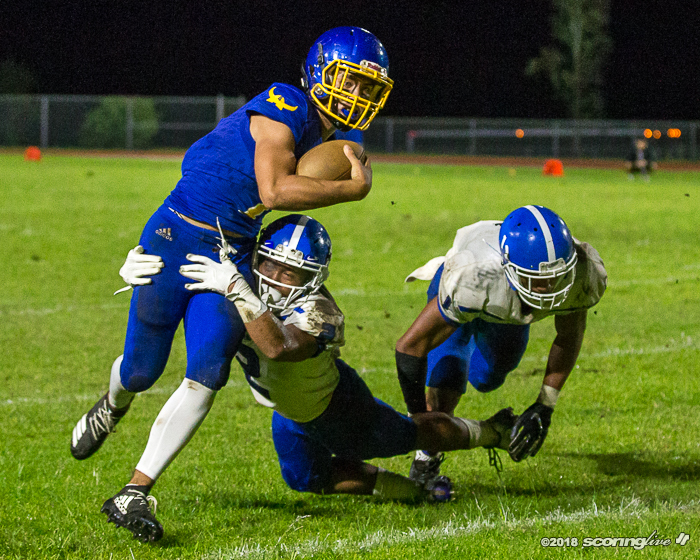 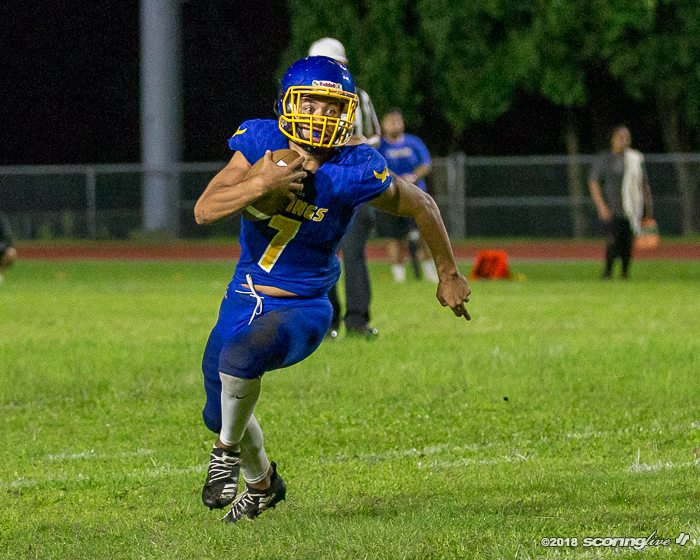 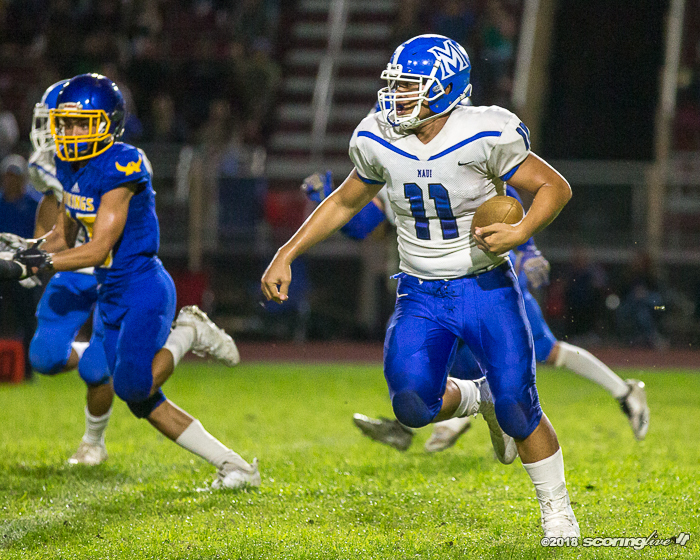 KEAAU, Hawaii — Kyler "Fiki" Aguiar secured the bag for the Hilo football team Friday night. 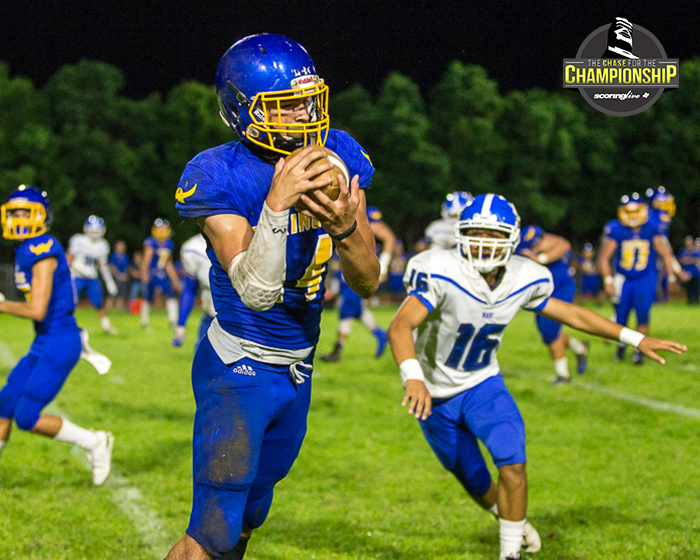 The junior receiver made all of his receptions after halftime and scored twice in the second half to help the Vikings hold off Maui, 35-24, in the semifinals of the First Hawaiian Bank Division I Football State Championships at Keaau High. 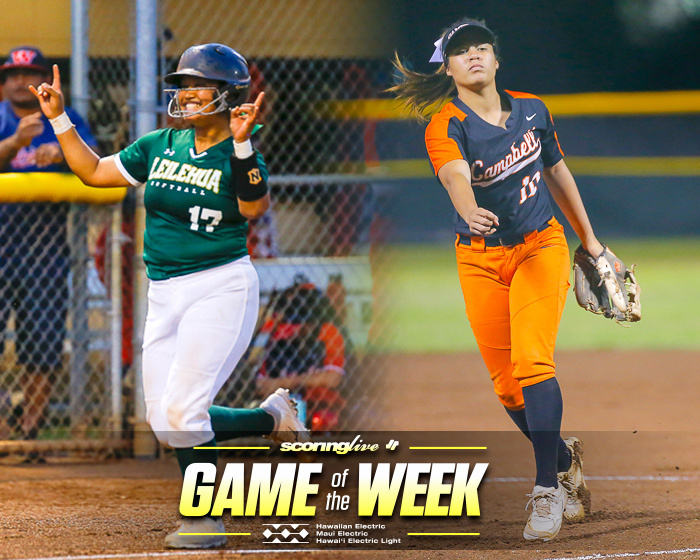 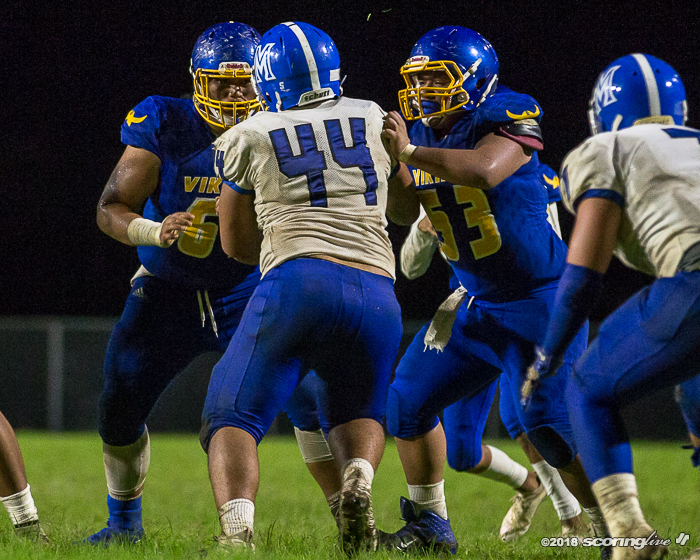 It was Hilo's second straight postseason win over the Sabers as the Vikings defeated Maui last year, 26-7, before beating Damien in the championship game for their first-ever state title. 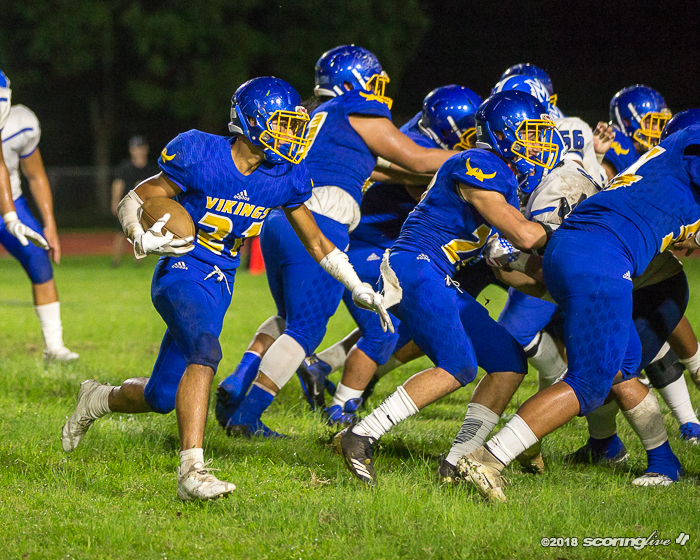 The Vikings (9-1) will defend their title on Saturday, Nov. 24 when they take on Waipahu — who beat Iolani, 20-19, in the other semifinal — at Hawaiian Financial Federal Credit Union Field at Aloha Stadium in the D1 final. 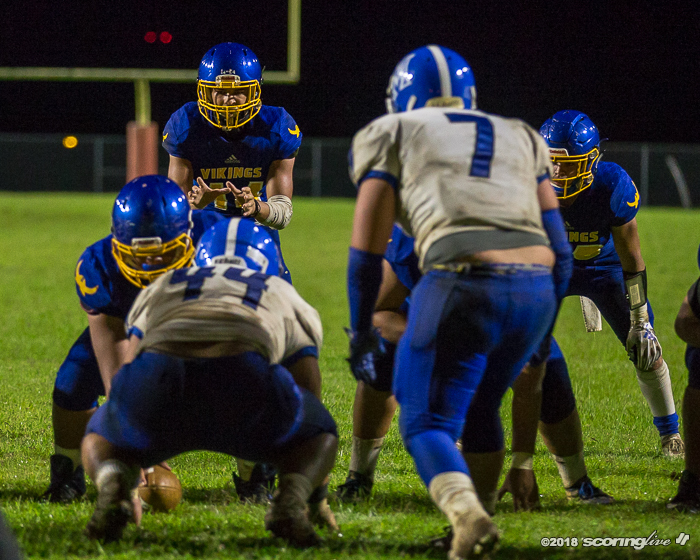 "There's no other feeling. 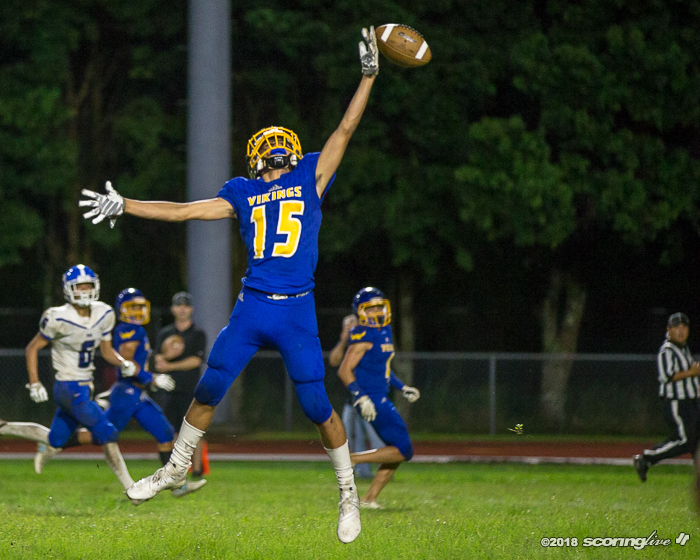 Nobody thought we would be doing this right now," said Aguiar, who finished with seven catches for 61 yards and a touchdown. 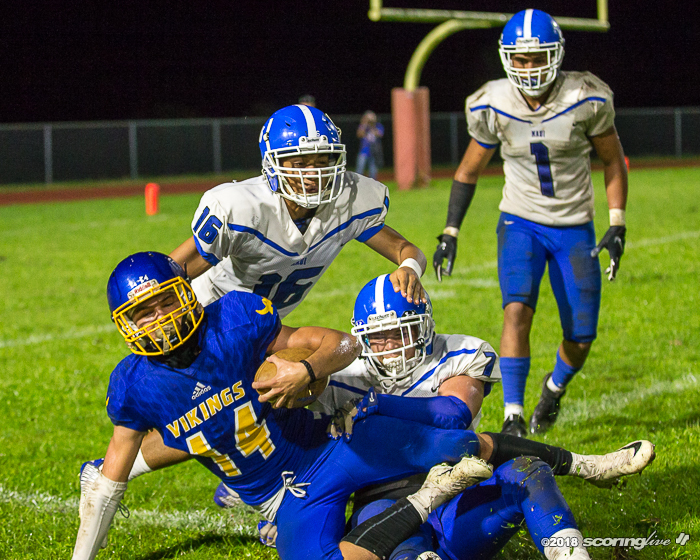 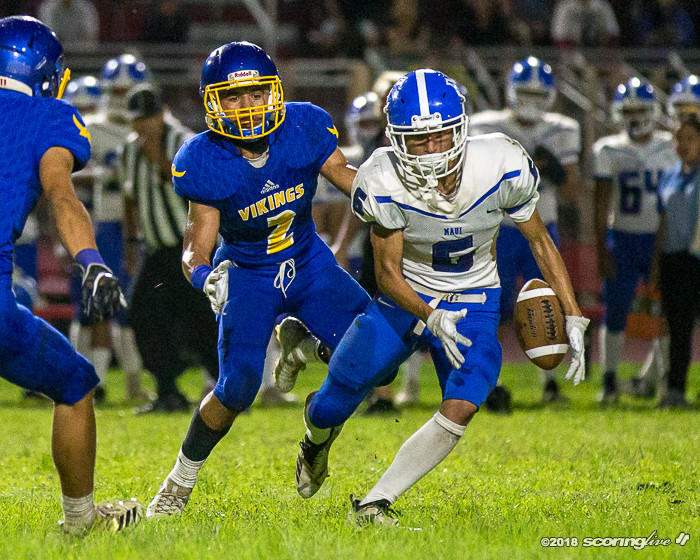 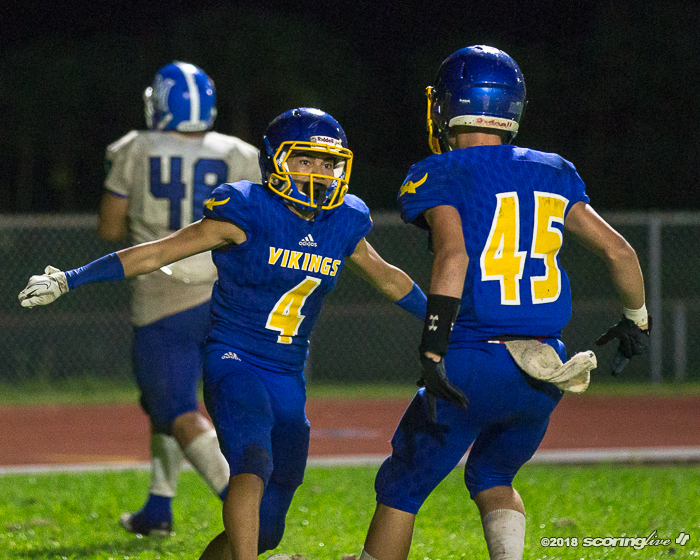 Aguiar's performance in the second half was much-needed as the Vikings turned it over four times in the third quarter, which led to two Maui scores that made it a 28-24 game heading into the final period of play. 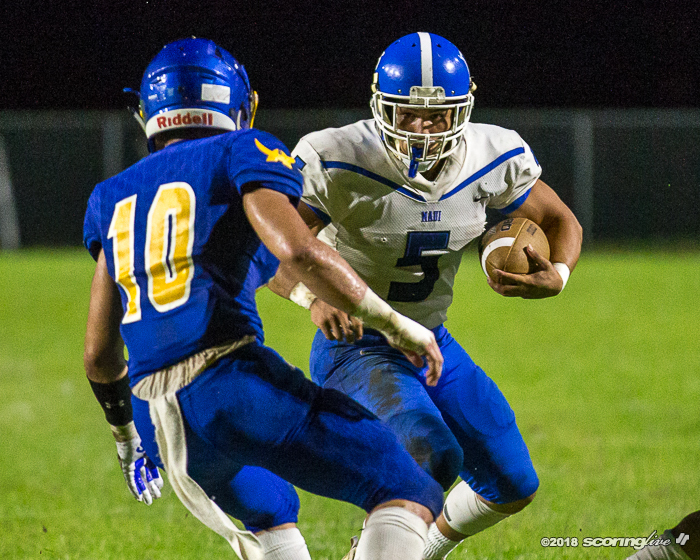 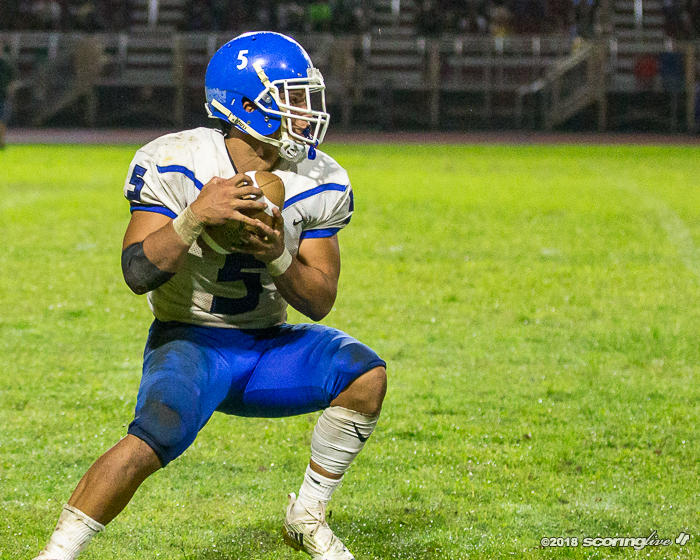 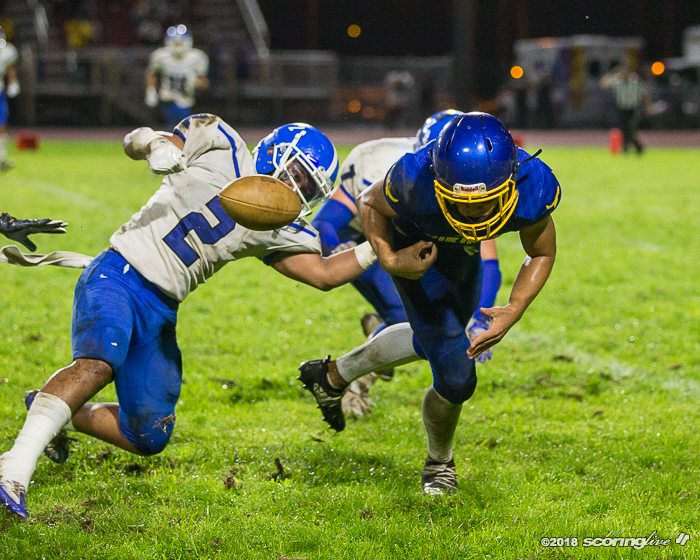 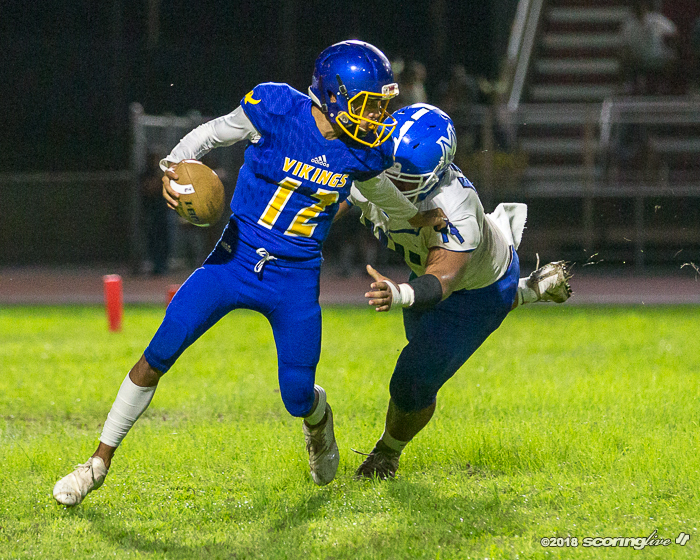 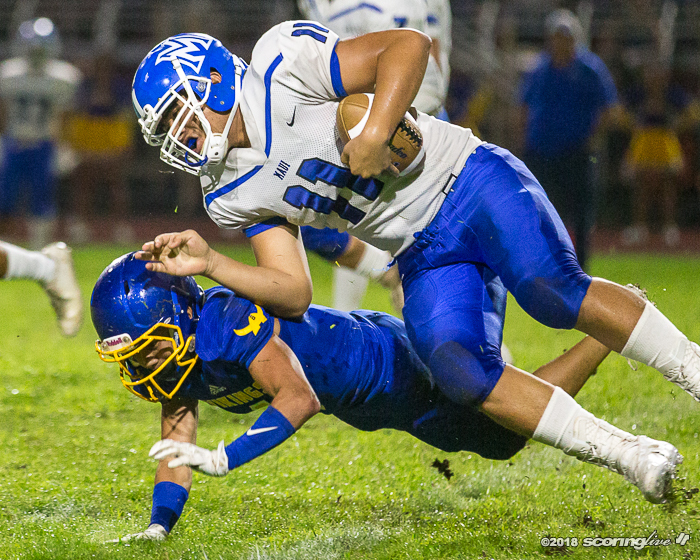 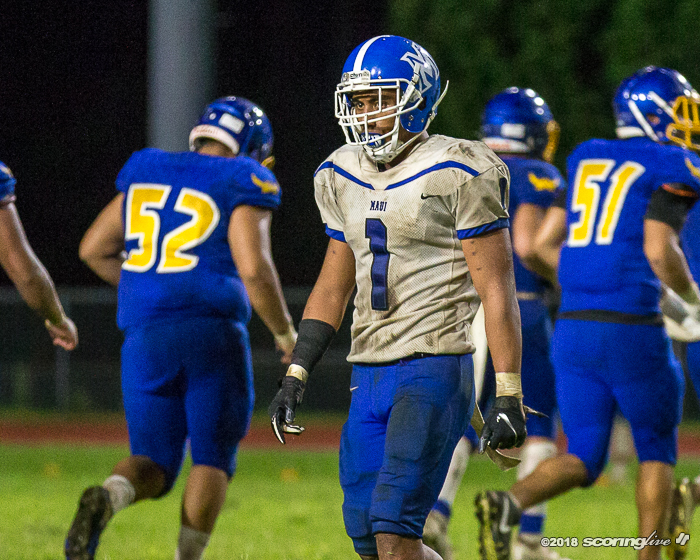 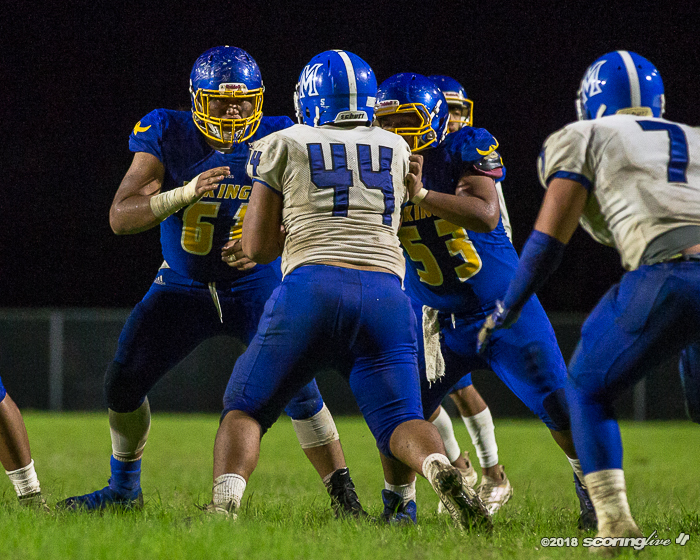 "Way too stressful," said Hilo coach Kaeo Drummondo. 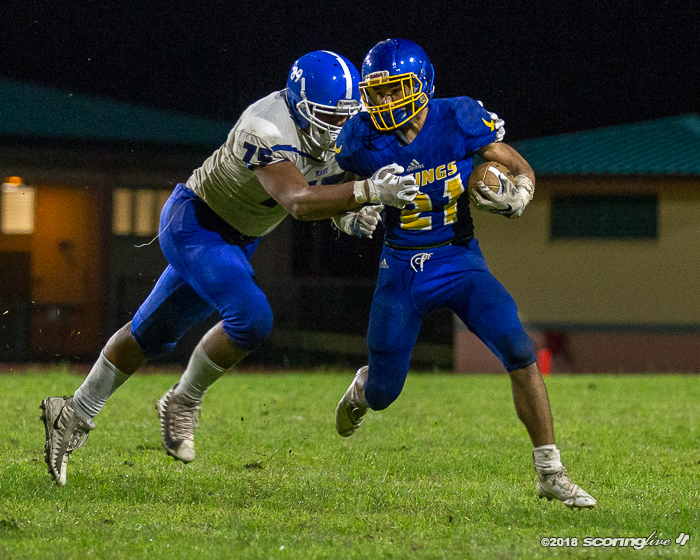 "You have to give (Maui) credit. 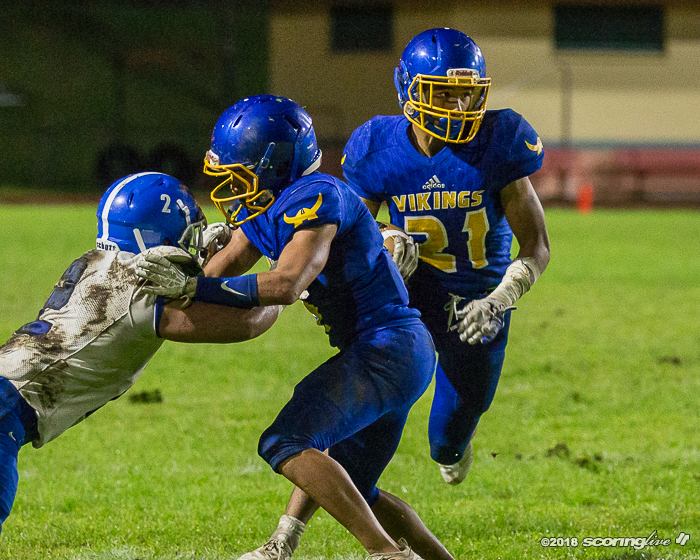 They forced a lot of turnovers. 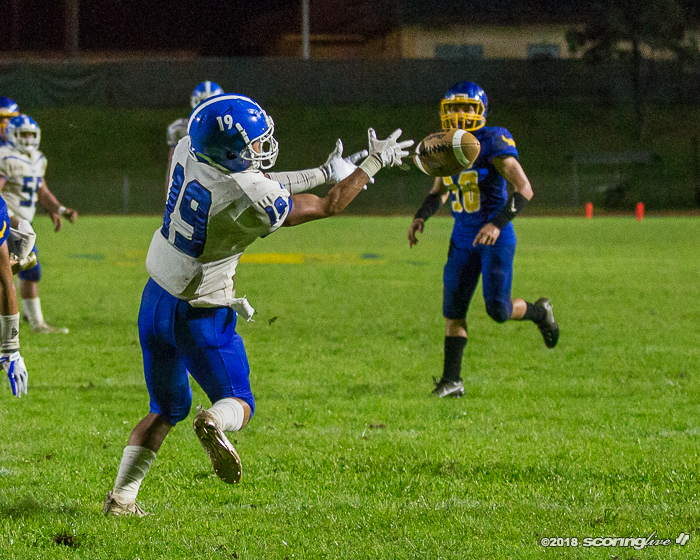 We'll take the ‘W' however we get them." 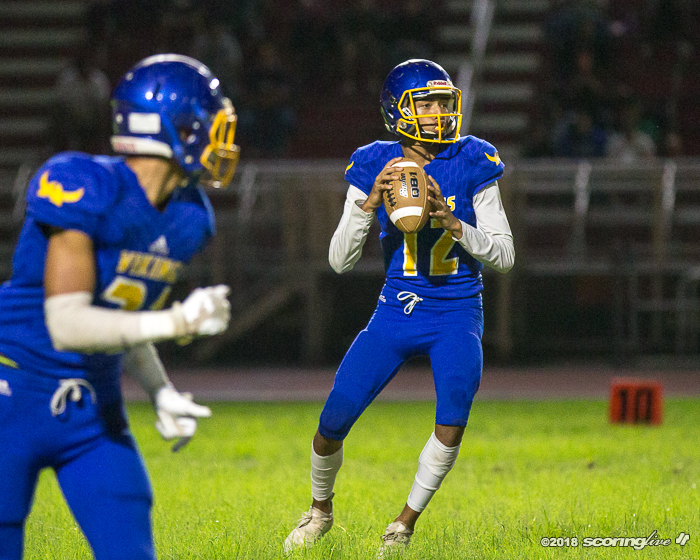 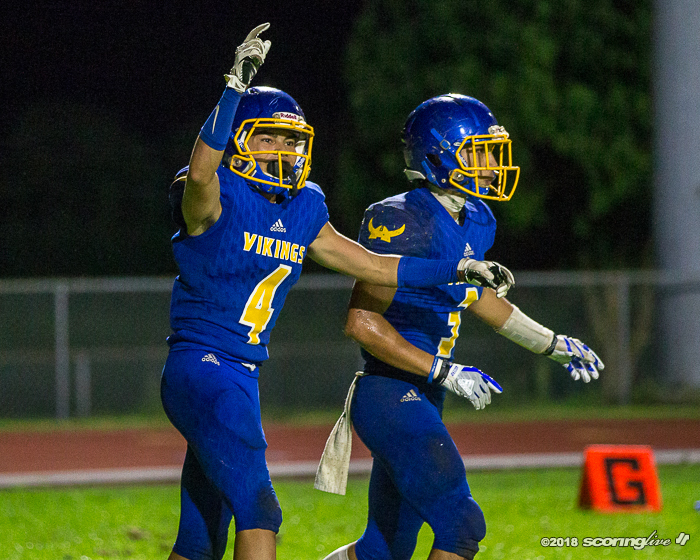 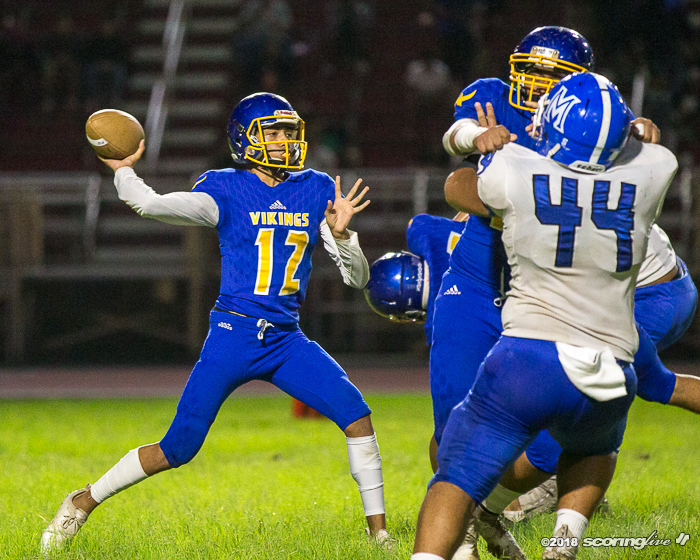 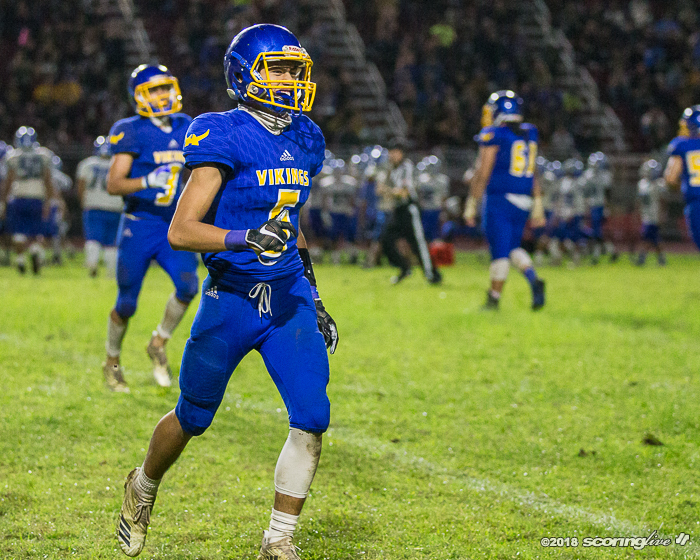 After going without a reception in the first half, Aguiar caught five passes for 55 yards — including a 1-yard TD — on the Vikings' opening drive of the third quarter to give Hilo a 28-10 lead at the 8:12 mark of the period. 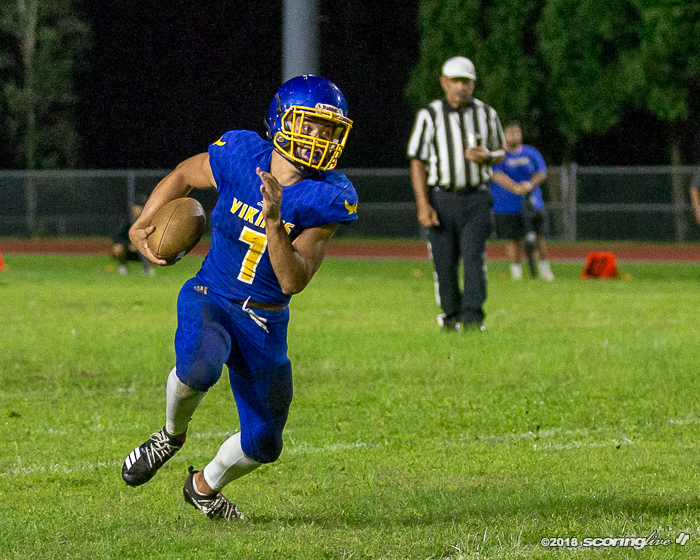 He also scored on a 1-yard run in the fourth quarter for the final points of the contest. 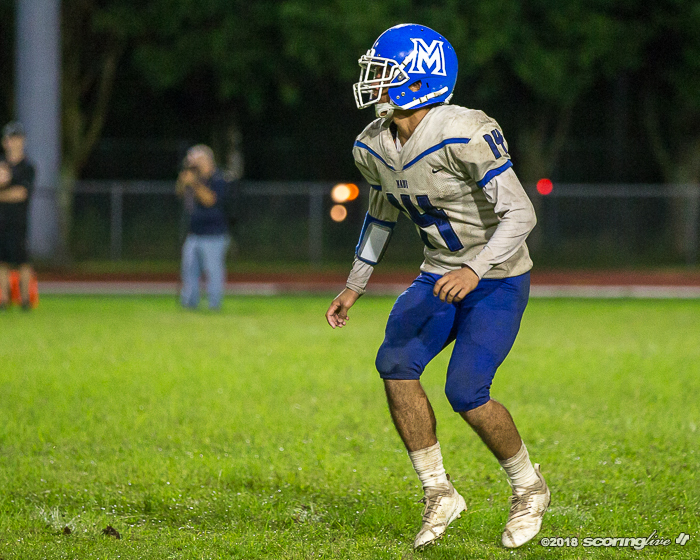 "Anytime he touches the ball, he's a threat," Drummondo said of Aguiar. 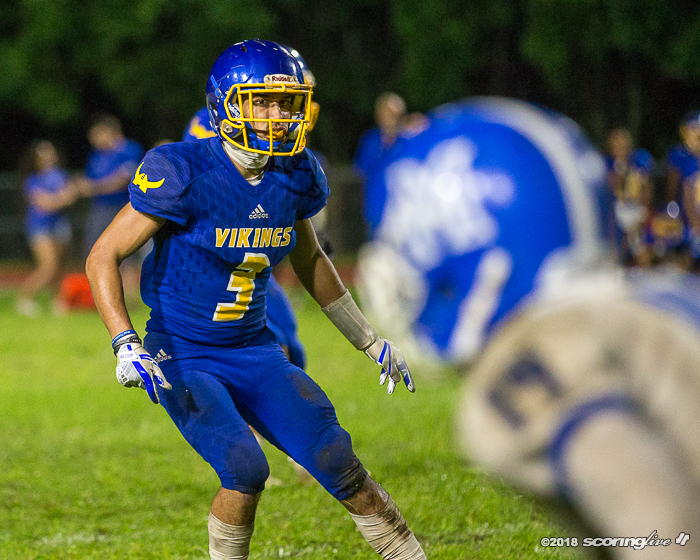 "He is what we need him to be and he's a playmaker." 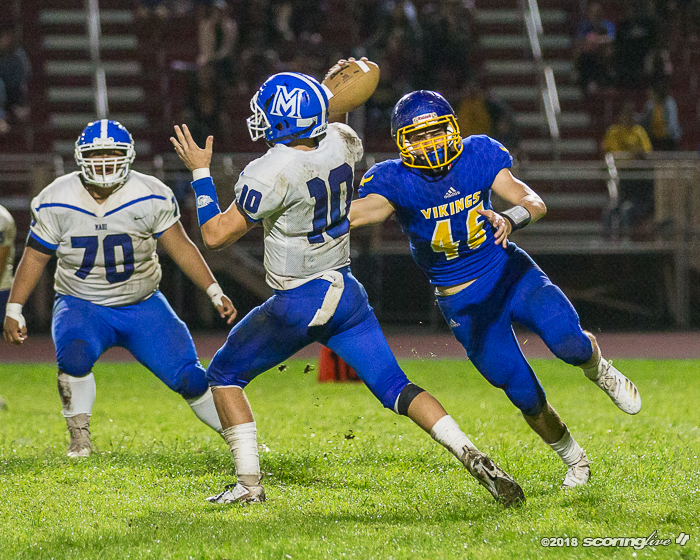 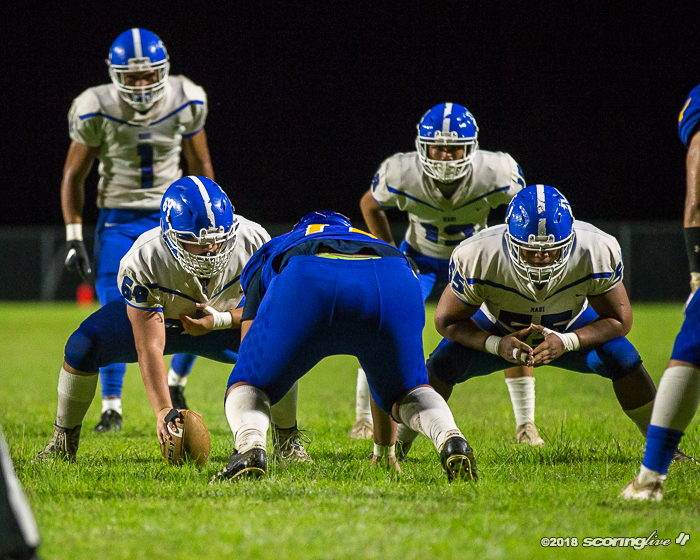 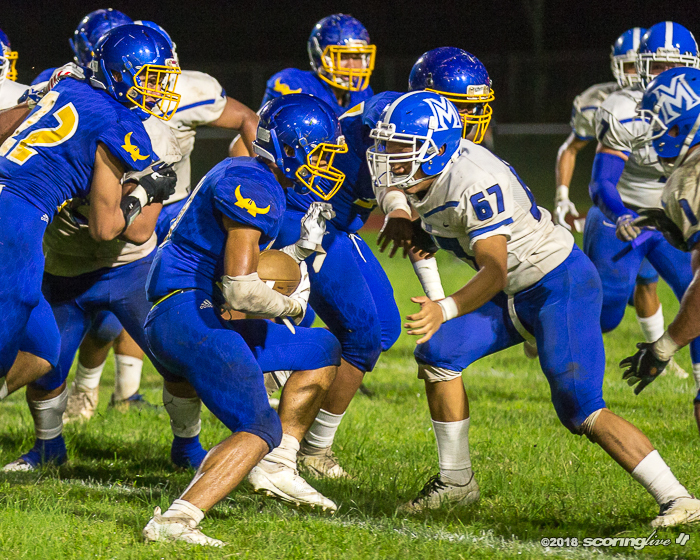 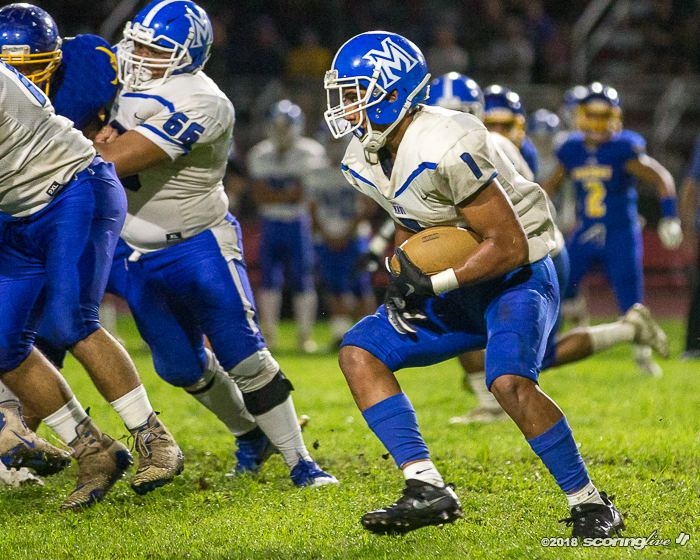 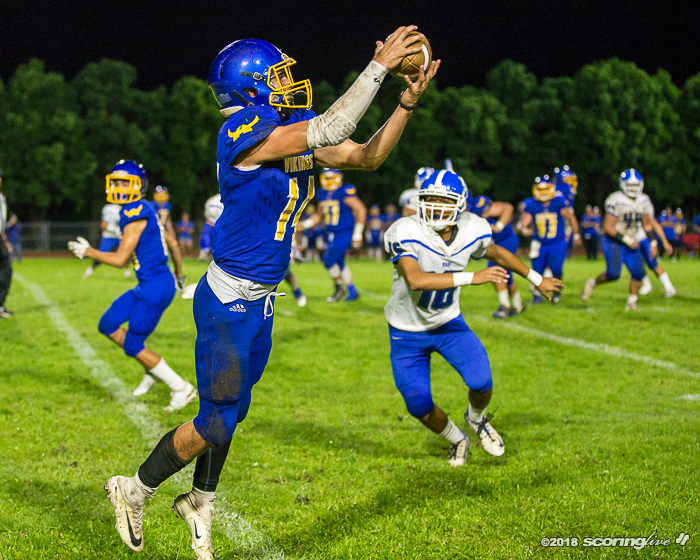 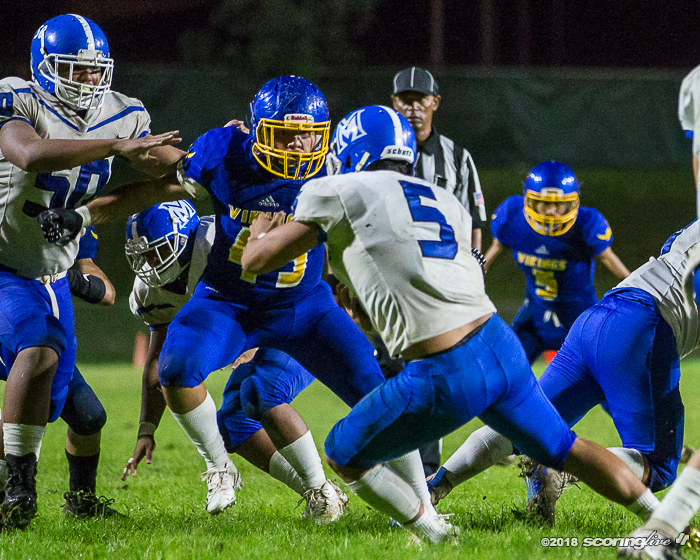 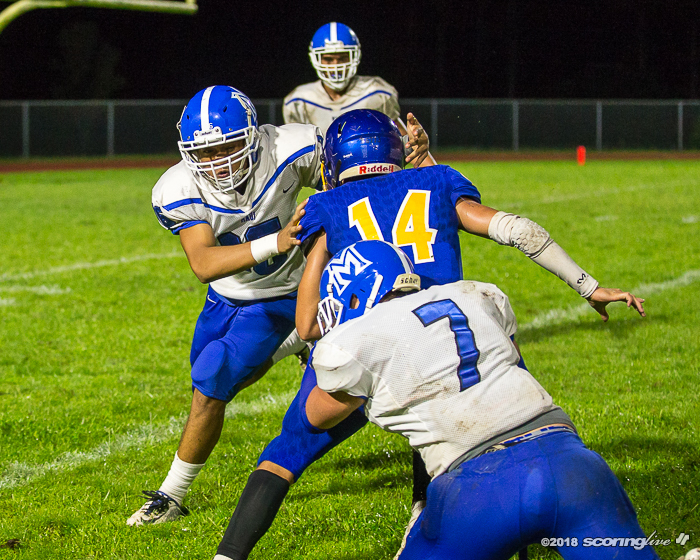 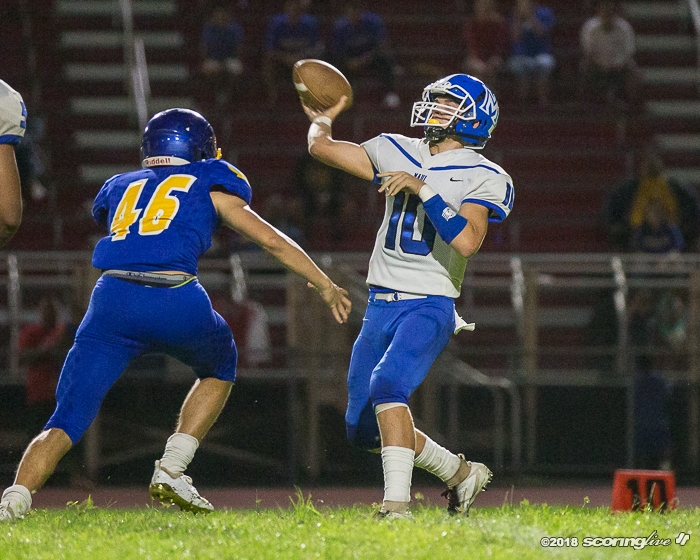 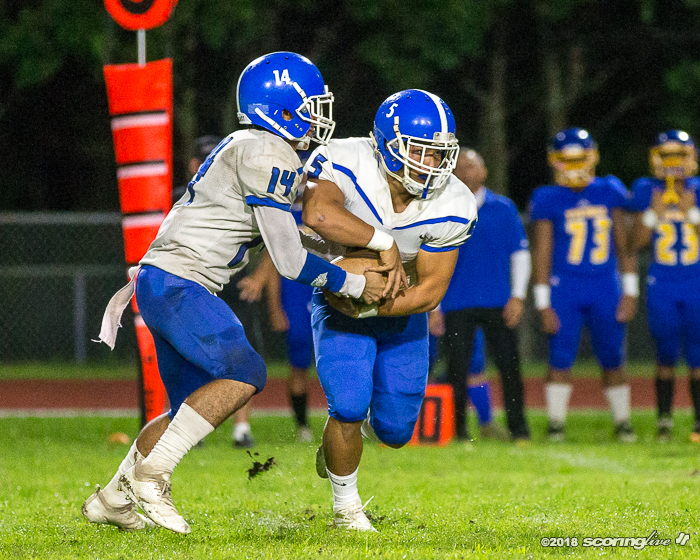 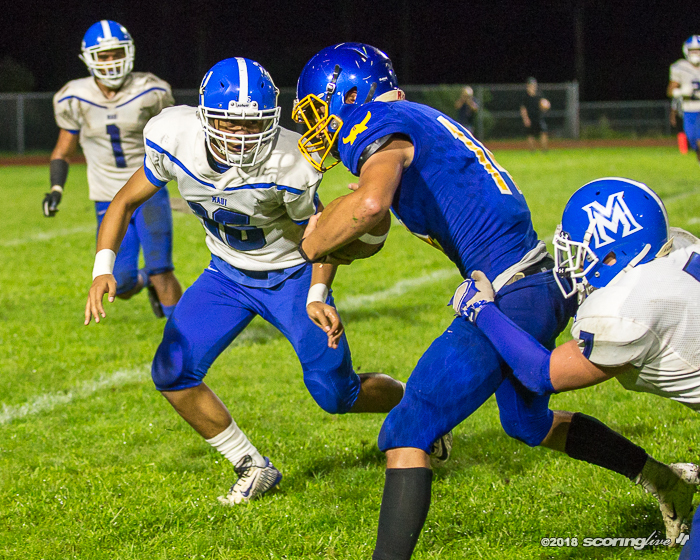 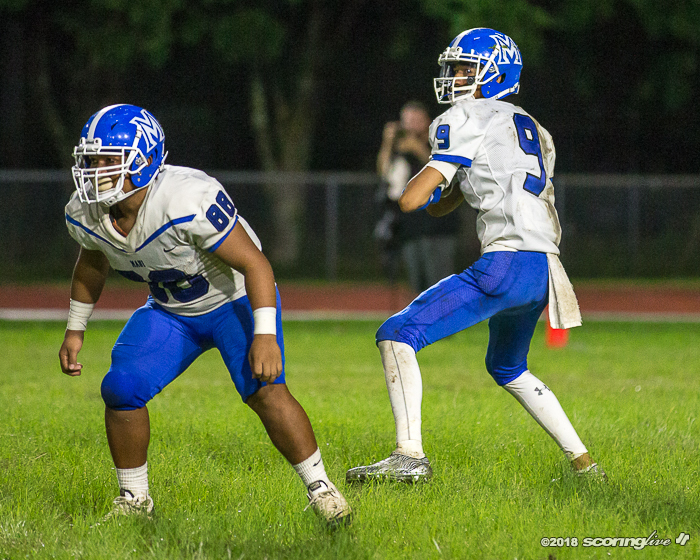 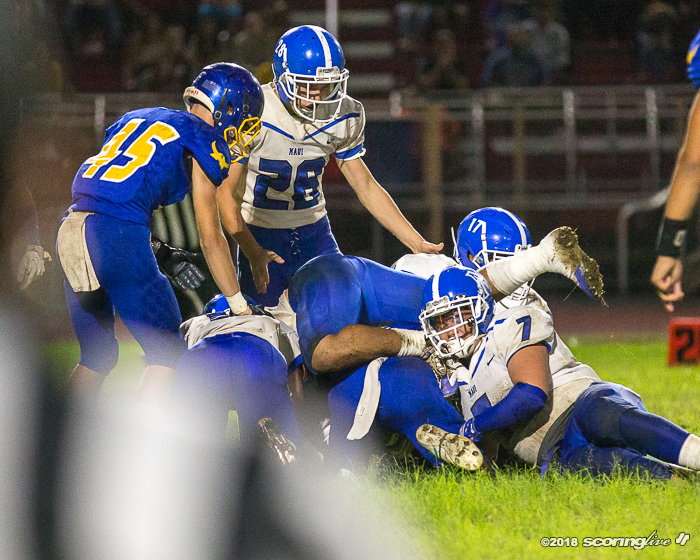 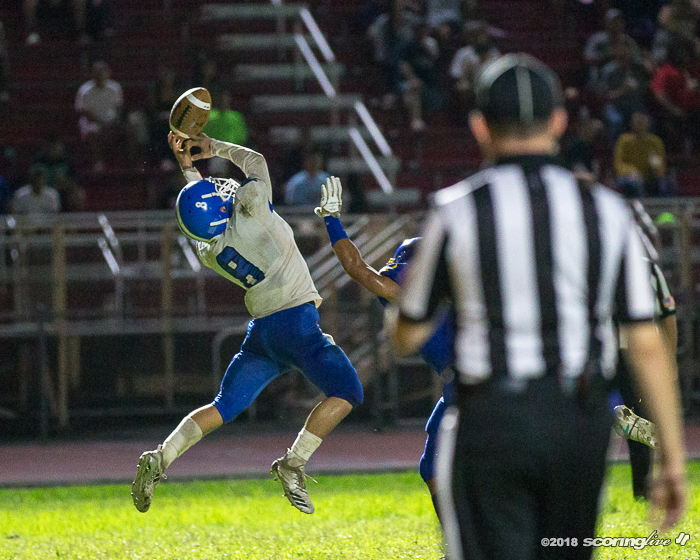 Hilo had more than double the amount of yards than Maui did, 402 to 183, but the Sabers (5-6) stayed within striking distance throughout the night with six takeaways. 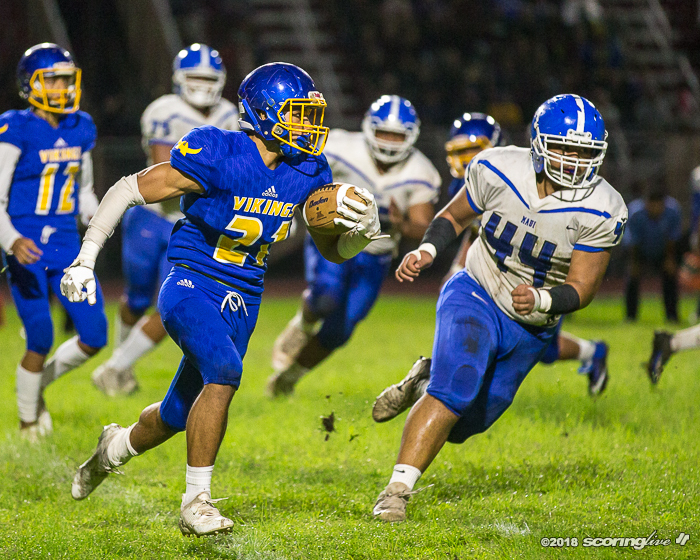 Mone Tongi recovered a Hilo fumble for a 57-yard scoop-and-score and later scored on a 17-yard scamper after Cameron Russell recovered a muffed punt by the Vikings to make it a 28-24 game late in the third quarter. 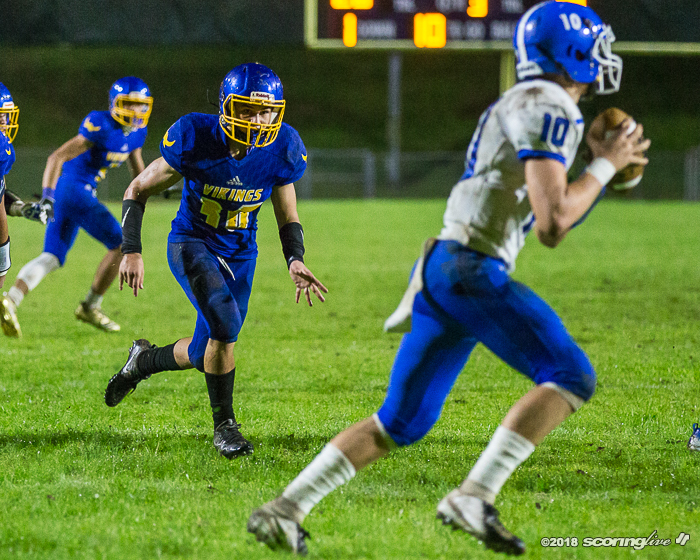 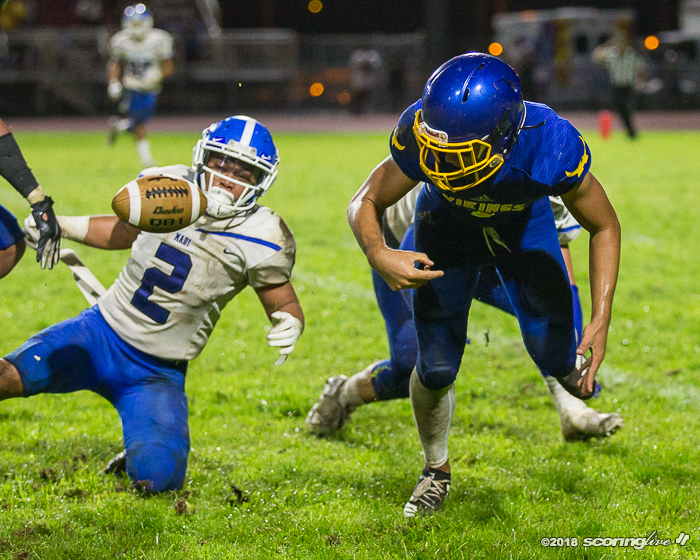 Ultimately penalties derailed the Sabers' comeback bid. 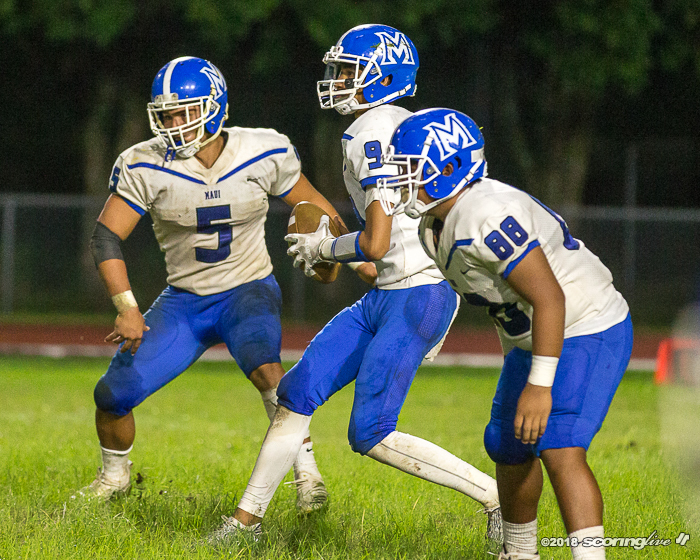 Maui didn't give up much yardage on fouls, nine penalties for just 63 yards, but the miscues came at inopportune times. 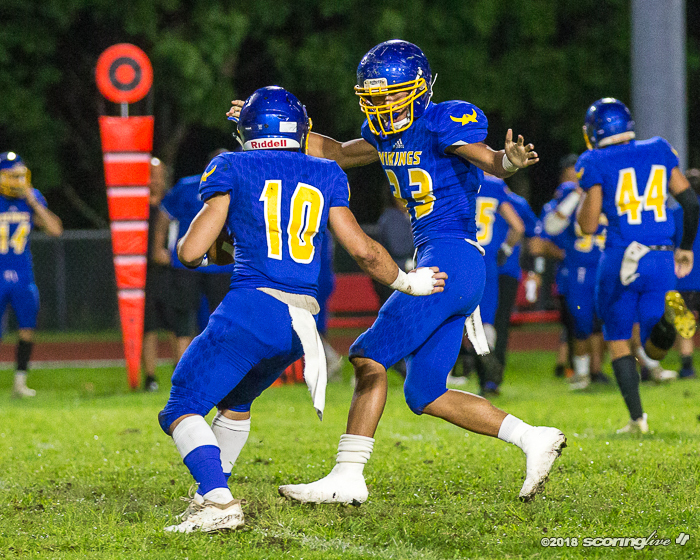 Poor execution on a double pass play resulted in an illegal forward pass penalty that wiped out a TD grab by Trent Takara in the third quarter. 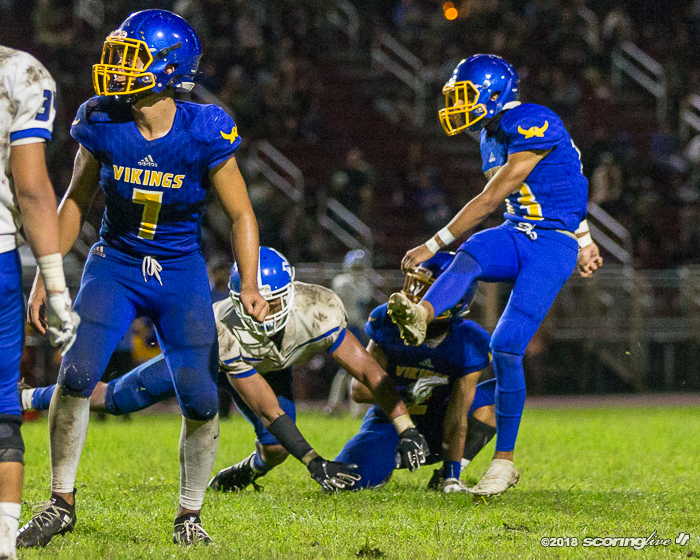 The Sabers were also whistled for a roughing-the-kicker penalty after Joshua Rosario booted a 32-yard field goal through the uprights. 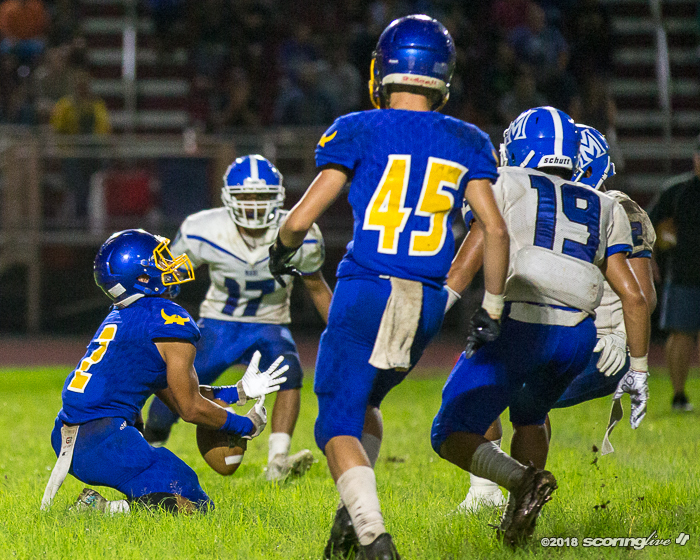 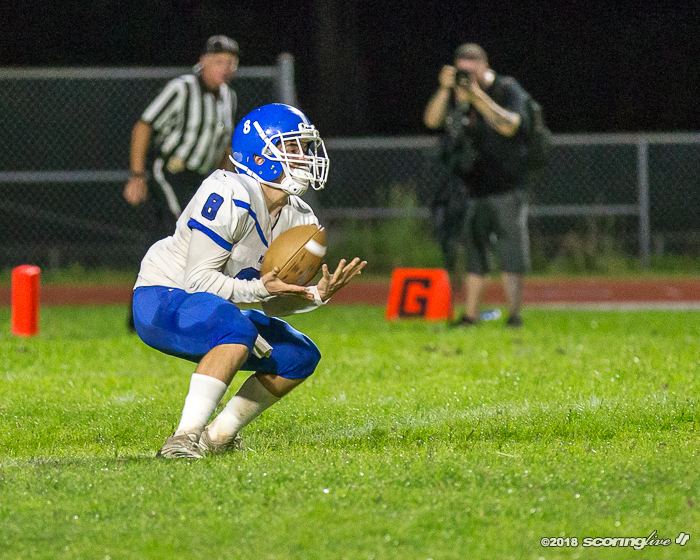 Hilo accepted the penalty to extend the drive, setting up Aguiar's TD run four plays later. 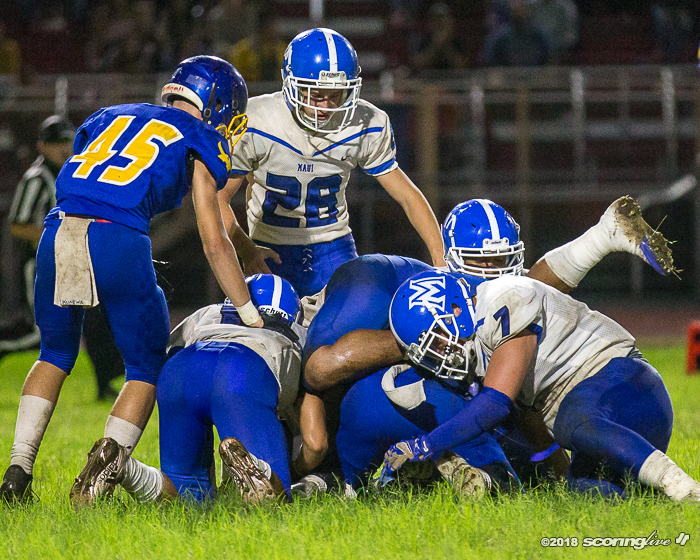 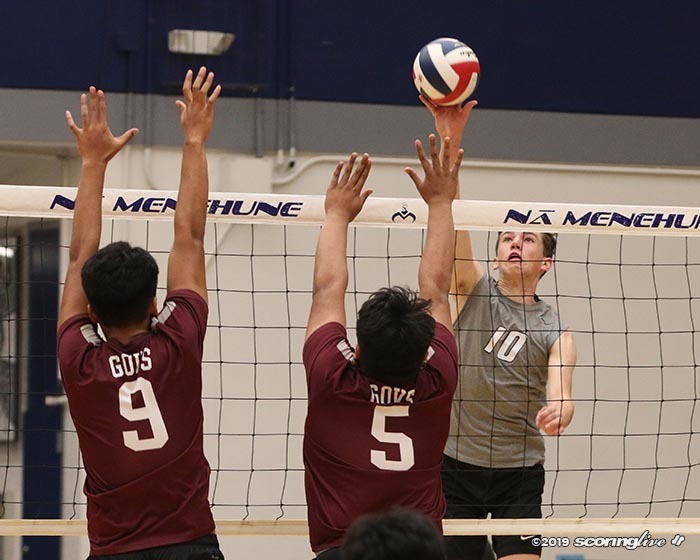 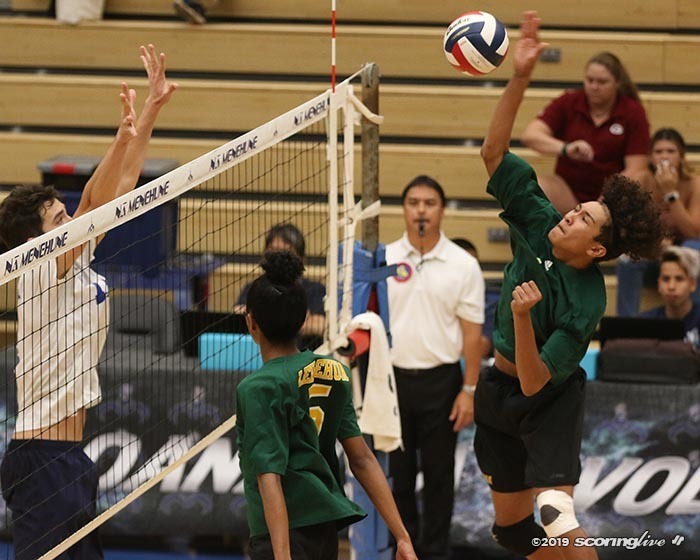 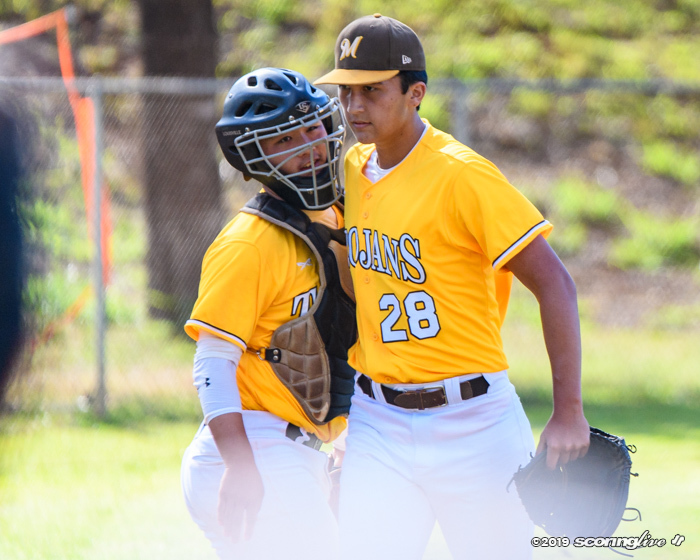 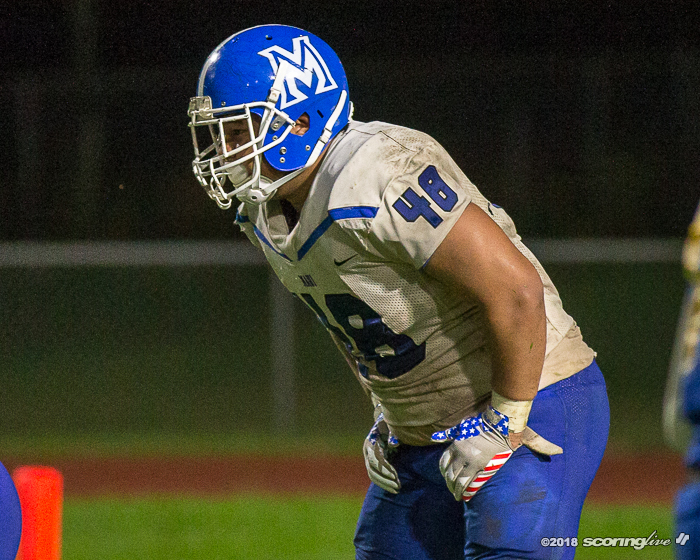 "Self-inflicted penalties," said Maui coach James Kammerer. 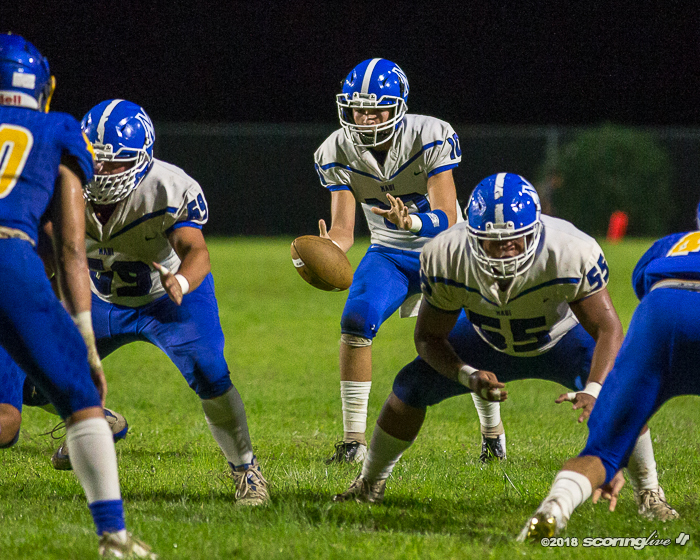 "We're not blaming any one person or coach, we're looking to grow as a program. 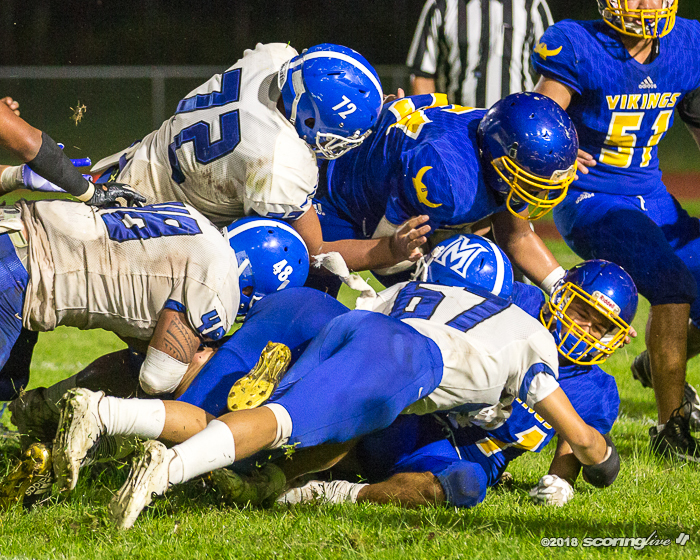 I'm proud of the effort, the boys fought back and got it right where we wanted it." 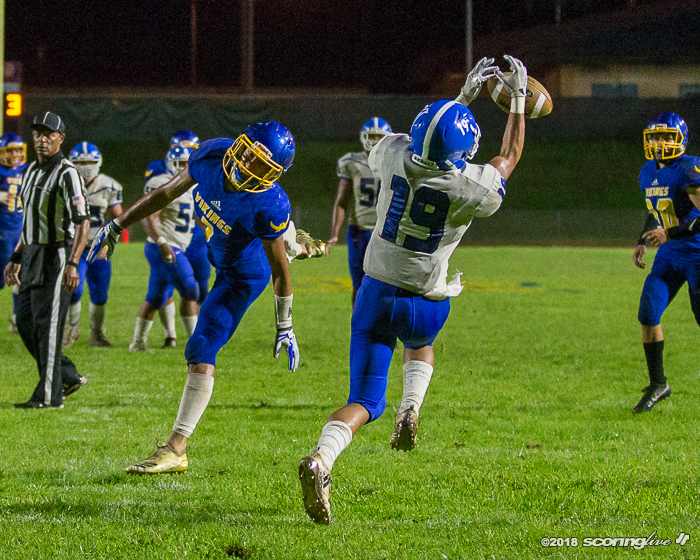 Kalen White recovered a Maui fumble on the Sabers' first third down attempt of the game to set up Hilo's first scoring drive. Kyan Miyasato, who threw for 225 yards and three scores, completed a 20-yard pass to Legend Figueroa on the very next play before tossing a 1-yard TD to Kalae Akui to make it 7-0 three minutes into the ball game. 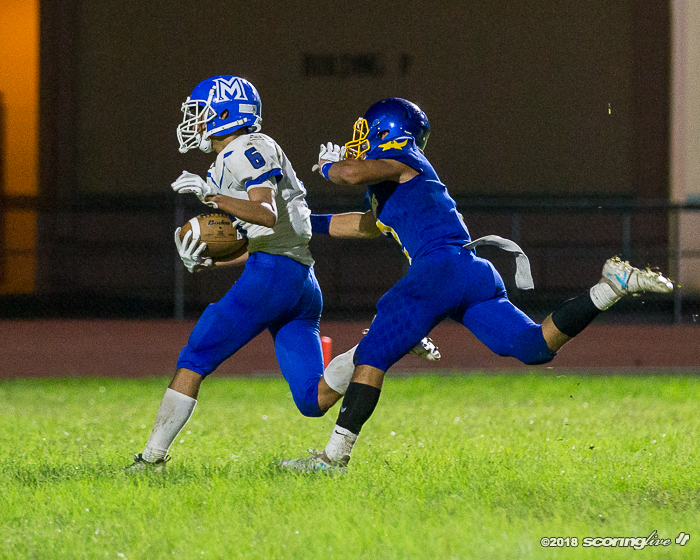 Like Hilo, Maui's first score of the night came after the defense recorded a takeaway. 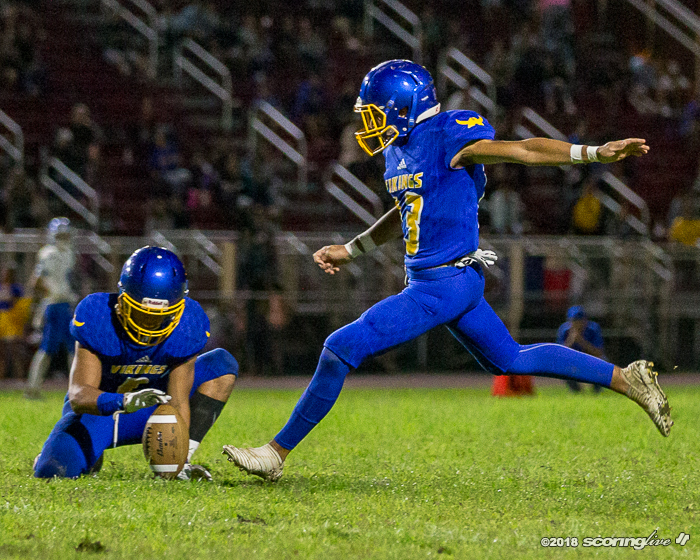 Russell picked off a shovel pass attempt by Miyasato at the Hilo 14, but the Sabers had to settle for a 32-yard field goal by Brex Delray. 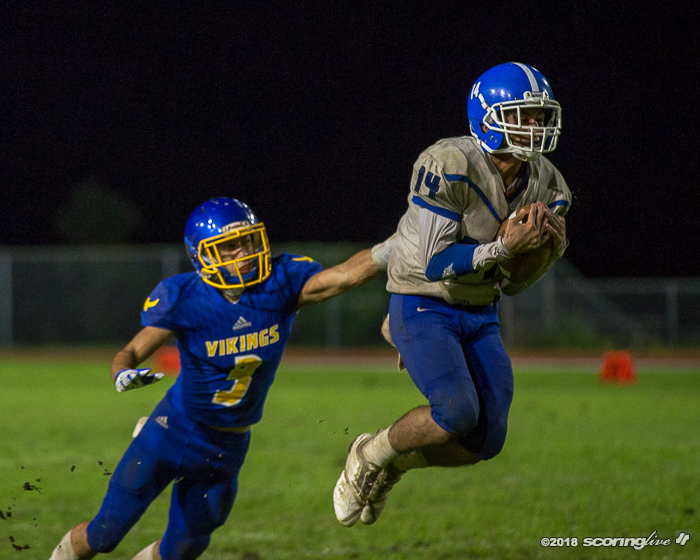 Hilo's next score came on a lengthy 11-play, 85-yard drive spearheaded by some tough-nose running by Kaleo Ramos (25 carries, 139 yards). 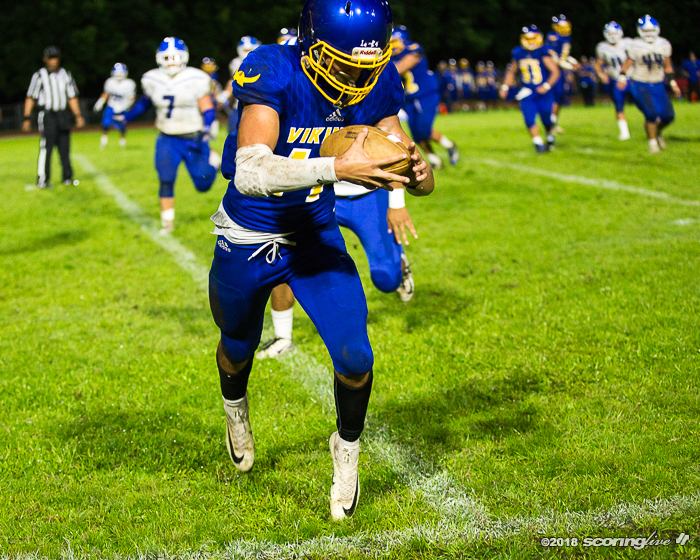 Guyson Ogata's 2-yard TD run capped the drive to give the Vikings a 14-3 lead with 7:31 remaining in the first half. 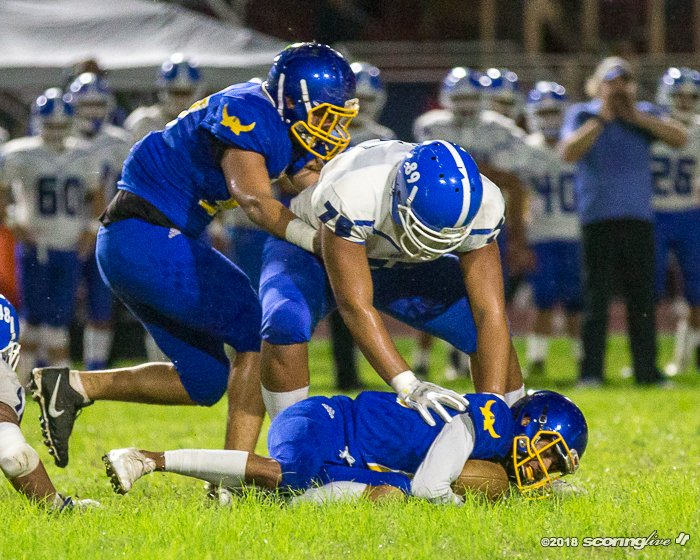 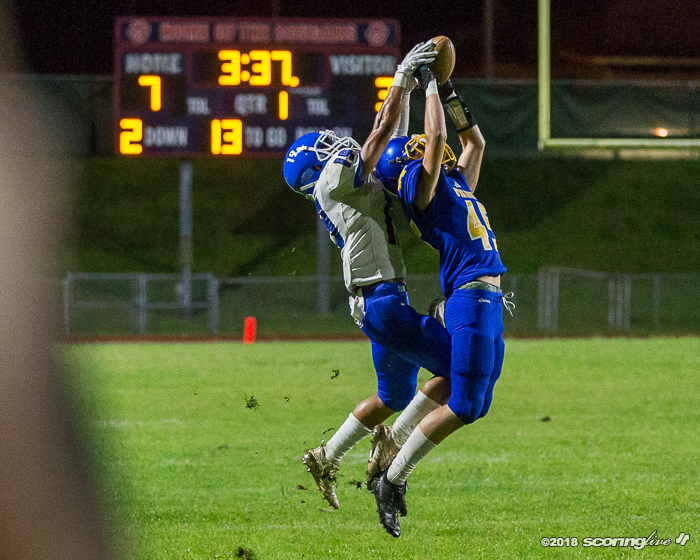 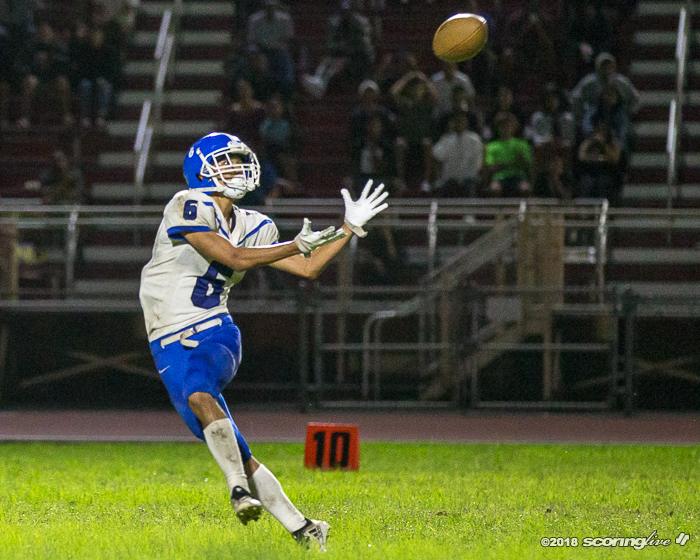 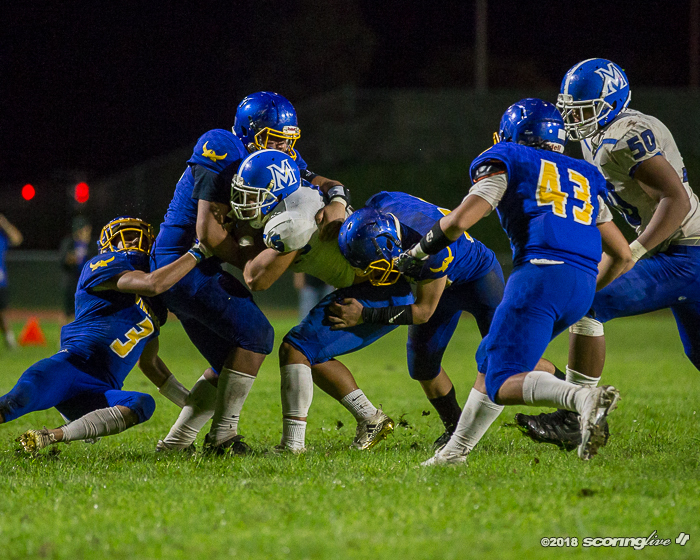 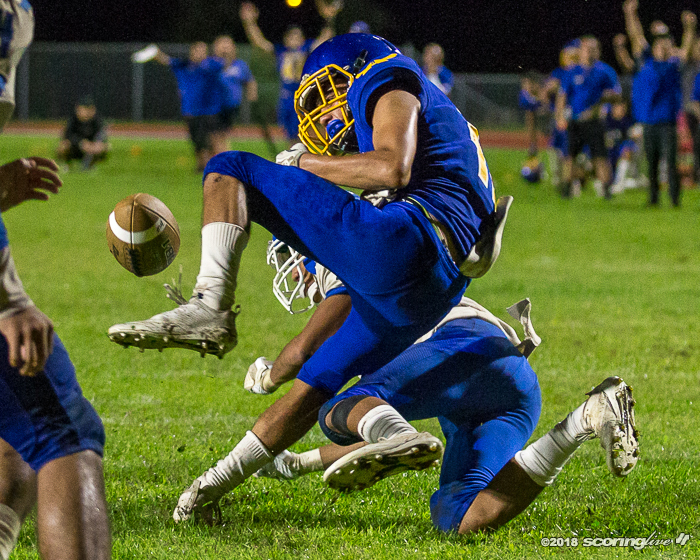 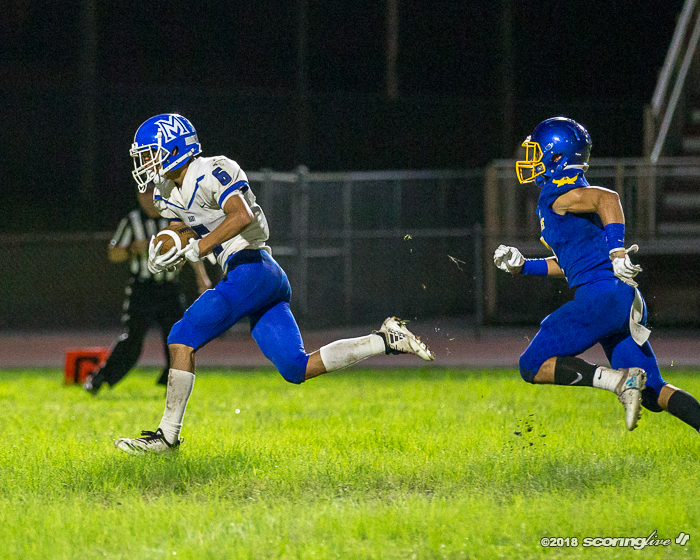 The Sabers' quickly responded thanks to a Naia Nakamato's 70-yard catch-and-run. 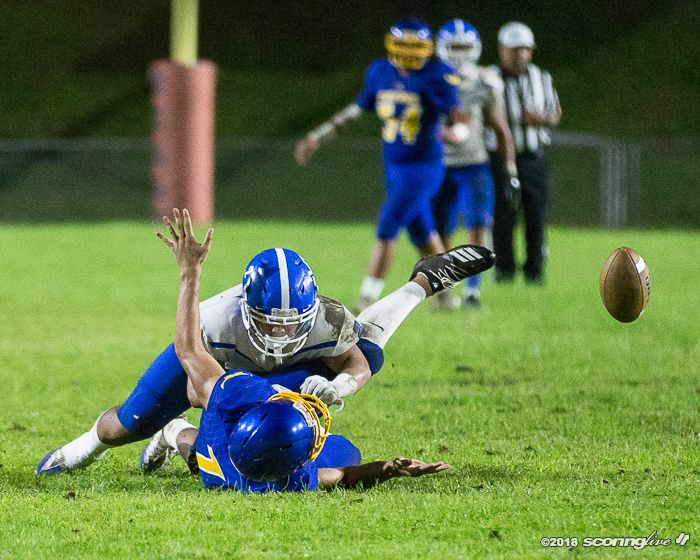 Delray threw the TD passes and also booted the PAT to make it 14-10 midway through the second quarter. 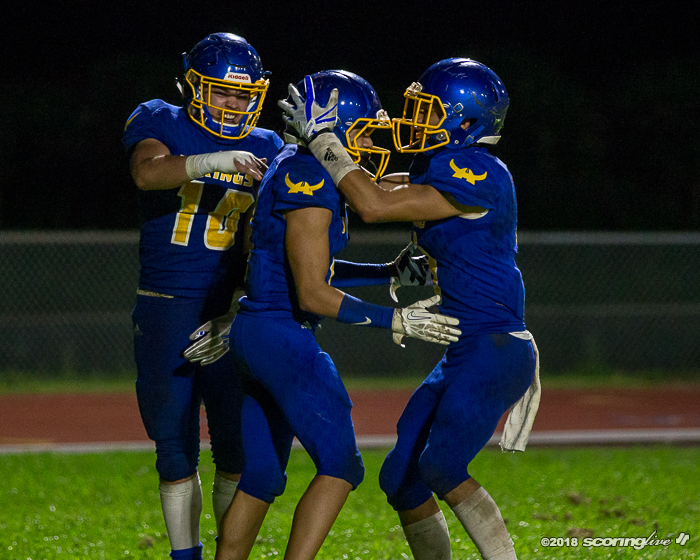 Ogata added a 45-yard TD catch from Miyasato with 23 seconds left in the first half to give Hilo a 21-10 lead at the break. 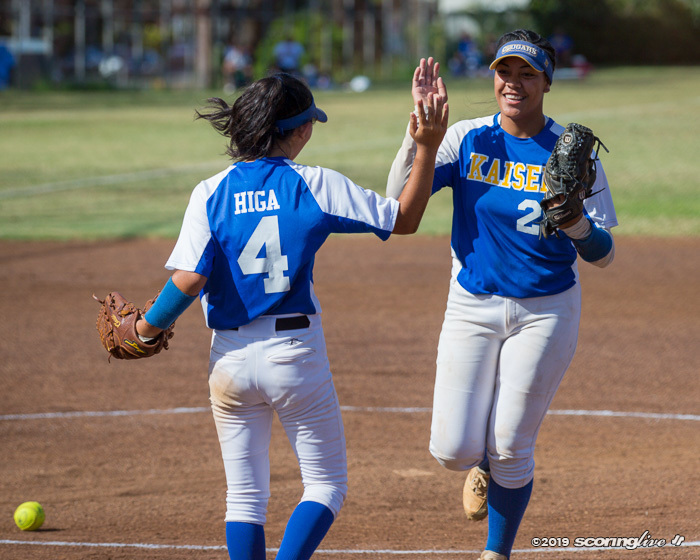 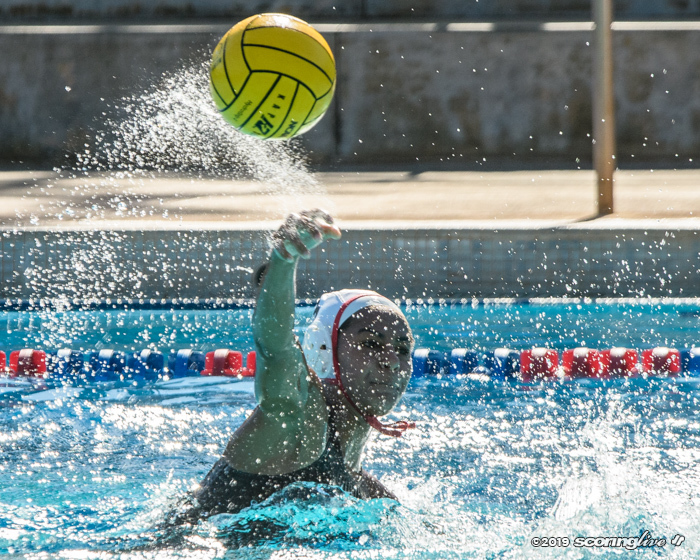 "I think we did an excellent job and we did what we had to do come out with the victory," said Ogata.